The Lost World holds a special place in my heart as it was the first ever movie I saw in a cinema and it left a lasting impression on me. I was 12 or 13 years old and still very much into dinosaurs after seeing the first movie. I was caught up in all The Lost World merchandise. You couldn’t really escape it. After the success of the original Jurassic Park, Steven Spielberg pressed author Michael Crichton to write a sequel to his first novel. Writer David Koepp (Jurassic Park, Mission Impossible) wrote the film’s screenplay and Spielberg returned to direct again. The characters of Alan Grant and Ellie Sattler are absent from the second film and instead, the story is very much focussed on Ian Malcolm (Jeff Goldblum) who goes from a supporting character to the leading man. He has quite a different personality from the first one too. He has a girlfriend called Sarah Harding (Julianne Moore) who is behavioural palaeontologist and a daughter called Kelly (Vanessa Lee Chester). We learn a lot more about Malcolm’s relationship with Sarah and his daughter at the start of the film. John Hammond (Richard Attenborough) wants Malcolm to go to a second island known as Isla Sorna to document the dinosaurs in their natural habitat. Sarah has already gone so Malcolm agrees to go to bring her back. 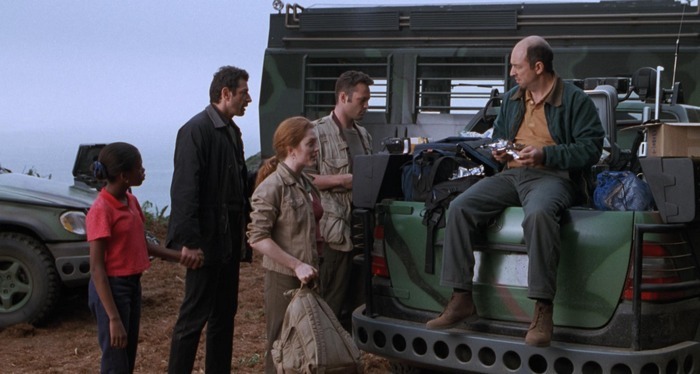 He goes with two other men called Nick Van Owen (Vince Vaughn) and Eddie Carr (Richard Schiff) and we find out Malcolm’s daughter Kelly has stowed away and another InGen team has landed on Isla Sorna. Everything goes awry and the group constantly tries to escape the island before being killed by something. The cast are okay except for Vanessa Lee Chester who I think has been badly miscast in the role. I’m sure she’s a fine actress but having her in the movie never really worked for me. I’d also say her character is completely irrelevant to the story. They could have written her out and we wouldn’t have noticed. I liked the cameo appearances from John Hammond and his grandchildren Tim and Lex who have grown up quite a bit since we last saw them. A character I really do like is hunter Roland (Pete Postlethwaite), leader of the other InGen party, whose sole mission is to capture a male Tyrannosaurus. Pete Postlethwaite brought a lot to the role. There’s a whole heap of dinosaur action in The Lost World, more so than the original and there are plenty of new creatures to please dinosaur fanatics. Like Jurassic Park, the full body shots of the dinosaurs moving are computer generated by ILM while Stan Winston and his team did the animatronics for close-up shots. The first setpiece involves a group of Stegosaurus attacking Sarah and then we have the second InGen team violently capturing various dinosaurs to take back to the park in San Diego. I must admit I always find it pretty disheartening when I see the Parasaurolophus being dragged down to the ground so ruthlessly. A Jurassic Park movie wouldn’t be complete without the Tyrannosaurus Rex making an appearance. This time Spielberg has upped the action and there are a male and a female who have an infant with them. 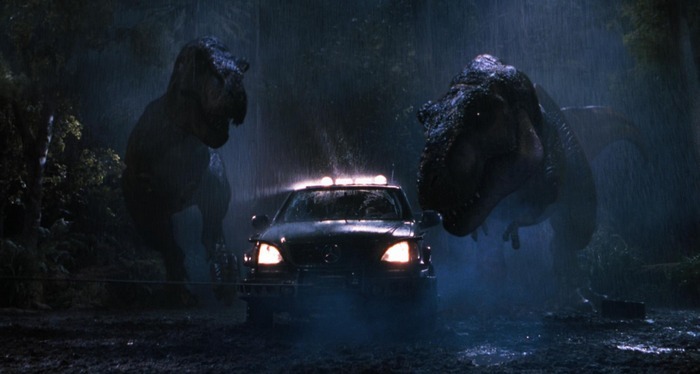 Their first appearance happens when the two Tyrannosaurus go after their stolen infant and destroy the trailer. Seeing two of them on screen at once is a great moment and they’re still as terrifying as they were in the original. The Tyrannosaurus appears a bit later at the camp and the waterfall. This scene was recycled from the first novel actually. 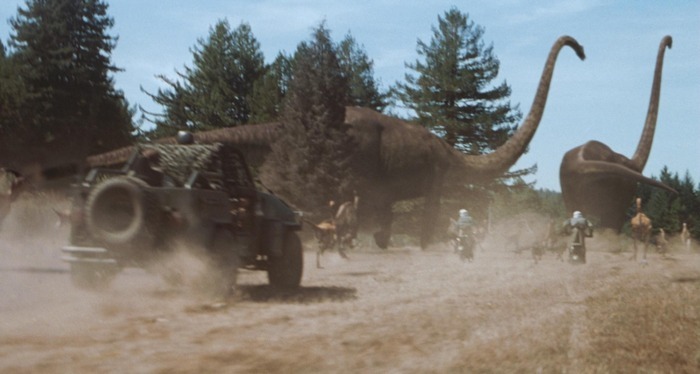 Towards the end of The Lost World, the Velociraptors finally make their long-awaited appearance when they attack InGen’s team in the tall grass. They follow Ian, Sarah and Kelly and attack them at the compound. They’re extremely dangerous, fast and intelligent creatures. The sequence was great to watch and it’s very entertaining. I’ll never forget the moment when Kelly puts her head under the wooden door only for a Velociraptor to suddenly appear next to it. It scared me half to death when I saw that in the cinema. The characters get rescued and just when you think the movie is over, there is another huge set piece waiting for us. We have a Tyrannosaurus escaping the freighter and goes on the rampage in San Diego. It’s always a tricky thing having a big creature rampaging through a city. It all gets too comical but it’s all good fun and that’s what counts. I think this scene sort of sets the tone of the film. It makes you think just how far The Lost World has drifted from the original Jurassic Park and what it was supposed to be about. The sense of awe and fascination of the dinosaurs is unfortunately gone because we’ve already seen so much in the four years since Jurassic Park was released. When I first saw The Lost World, I absolutely loved it and I thought it surpassed the original. As I’ve gotten older, I do appreciate the first movie a lot more. Despite its problems, I do like The Lost World a whole lot more than Jurassic Park 3.